He’ll call when he arrives. French cinema in the post-World War II years was an interesting time. French directors opted for minimalist realism, even with movies billed as thrillers. Dirty Money (Un flic, A Cop, 1972) follows master criminal Simon (American actor Richard Crenna, known for his role as Col. Trautman in the Rambo movies) as he evades his good friend, Superintendent Eduoard Coleman (Alain Delon), after he robbed a bank. Little does he know that his girlfriend (Catherine Deneuve) has started an affair with Coleman as the latter closes in on Simon. 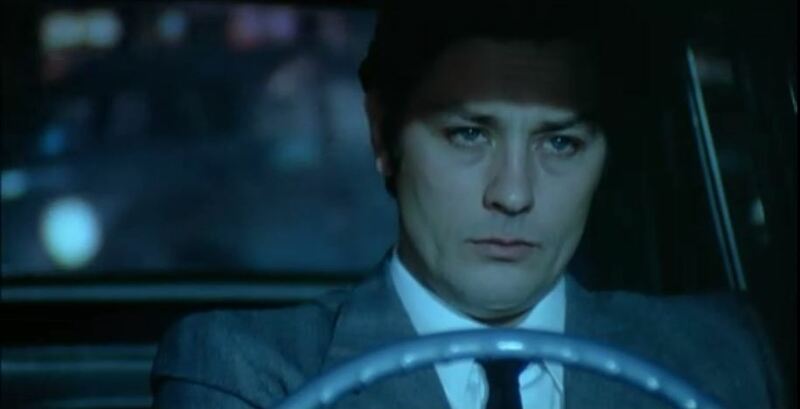 Jean-Pierre Melville’s Un flic is a movie that came from the tail-end of the French New Wave. As such, the movie had pretty minimal plot, allowing itself to be completely character driven. Such style of storytelling is characteristic of French cinema at the time, as seen in the earlier Melville/Delon collaboration Le Samourai (1967). Very much like The Graduate, Un flic was much more interested in keeping the viewer immersed in the “here and now” as opposed to the movie’s big picture. With that in mind, you can see how much love and care Melville put into each and every shot int he movie. With any competent director, everything that appears in a frame of movie has a very specific purpose. However, Melville’s shear meticulousness almost rivals that of Mike Nichols. In the bank heist scene at the beginning, the camera pans the interior, showing the windows as a storm rages outside. Then, the camera stops and focuses on the car containing Simon’s co-conspirators. You can barely see the car with the storm, but you know its purpose. Un flic was a movie more about process than end results. What comes to mind is the long, drawn-out sequence where Simon steals a briefcase of drugs from a courier. He rides a helicopter to board a train (in motion), climbs into a restroom, changes into sleepwear, slips into the courier’s room, knocks him out, loads the drugs into briefcases, goes back to the restroom, changes back into his protective clothing, and climbs back onto the helicopter to make his escape. Un flic was stylish in a way that is uniquely French from the 1970s. Melville seemed to love quickly alternating head shots of the actors staring at each other (and in one case, Delon staring at a dead woman). The movie is complete with nightclub scenes. Alain Delon was about the closest thing France had to a Sean Connery, and in the 1960s and 70s, Catherine Deneuve could very well have been the most beautiful woman in the world. And like many French New Wave movies, the average modern American viewer will find the movie to be way slow for their liking. If you plan to sit down and watch this movie, I highly advise keeping the area free of potential distraction. In typical French neorealism, the characters clearly were not constrained by a plot and thus didn’t transform like one would expect them to in a work of fiction. If you do want a challenge, Un flic is a great one to pick up though. It’s shear style would be enough to reward the viewer, but it is by no means an easy watch.